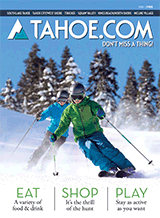 Come to the Community Recreation Center Gym for the 36th annual Truckee Ski & Snowboard Swap. New and used winter equipment for the entire family. Come join the fun and look for bargains. Local reps from ski shops and resorts will be on hand to answer your questions. Plus, the Silent Auction will feature Season Passes, Lift Tickets Local Gift Cards, and More! Admission $2 for Ages 13+, Kids 12 and under free!! !